This is the first of many (hopefully not too many) blog posts intended to help GigMasters members get better aquainted with their Control Panels. Your Control Panel is the lifeblood of your GigMasters account. It's how you interact with clients, make changes to your Profile and, should you opt into accepting online payments, it's where you get paid. Some of what we cover in this series will be old news for our long-time members, but every Control Panel comes so loaded with features there's always something to learn. So let's get started! 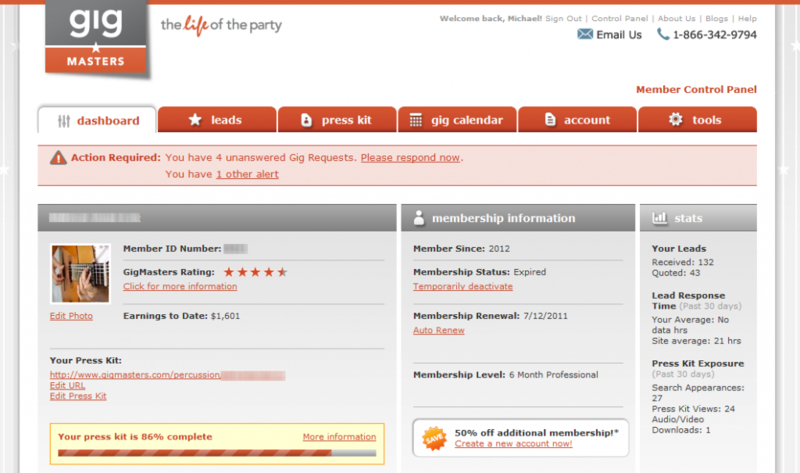 We reserve the space at the top of the page to alert you to important items like unanswered gig requests, unclaimed payments, site maintenance alerts and other essential messages from GigMasters. In the main columns of your dashboard, you'll find important information like your Member ID number, renewal date, membership status, etc. You can even edit your Profile URL from the dashboard. One very helpful feature on every active Control Panel is the Profile Complete Bar. Located on the bottom left of the dashboard, this widget tells you exactly what you need to do to optimize your Profile for potential clients who come across your listing. We'll let you know if we think you need more audio or video, upcoming or past appearances or anything else that might catch a client's eye. Look to the far right of your dashboard and you'll find some important statistics. These stats give you a glimpse of how you are doing in terms of leads and Profile views. These figures are just intended to give you a broad overview of where you stand on GigMasters. You will find more in depth stats once you start exploring the rest of your Control Panel, but that's a trip for another day.